The trot is a two-beat gait with the two diagonal feet of the horse striking the ground at the same time. 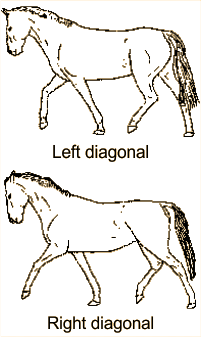 Between the impact of the two sets of diagonal feet, there is a period of suspension when all four of the horse's feet are off of the ground. The period of suspension may vary depending on how much the horse's legs bend and how much force is used as the horse pushes its weight off the ground. The trot may vary from a low shuffling motion to an energetic passage in which the horse appears almost to float above the ground. The length of a trot's stride may vary from an almost stationary piaffe to the maximum distance of the extended trot. Noted Portuguese rider Nuno Oliveira claimed there were more than ten variations of the trot. 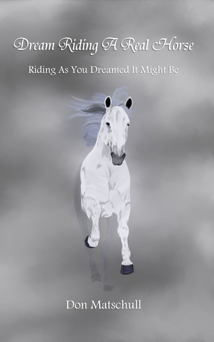 The impact of the horse's feet hitting the ground is not the cause of the jarring many riders experience when trotting. The impact the rider feels is the impact that occurs when his seat, which has risen from the saddle, comes in contact with the saddle again. A rider who does not follow his horse's action goes up when his horse goes up, but does not go down immediately when his horse goes down. Instead, he lets the momentum of his rising body continue to lift it until gravity takes over. As gravity takes effect, the rider starts to descend. By this time, however, the horse has already begun to rise again. This causes a collision as the two bodies meet. Many people become nervous when a horse begins to trot. They squeeze with their legs to hold on to the horse and pull on the reins in an effort to keep the horse from going too fast. These actions on the part of the rider cause the horse to become tense. When a horse becomes tense, his motions are not as smooth. The rising trot — often called posting — was developed to make the trot more comfortable. Many riders, however, transform the rising trot into deep knee bends, exerting much more effort than necessary. At the same time, they often loose their balance and plop back into the saddle causing the horse to stiffen its back muscles to absorb the shock. The stiffer the horse, the rougher the trot. A rider should let his horse's movement lift his body while engaging his abdominal muscles to draw his hips forward to keep up with his horse's forward motion. The rider can also use this forward motion of his hips to help control his horse's speed and stride. Normally, a little more effort in this forward motion causes a little more forward motion on the part of the horse. For many people, a good sitting trot can prove more of a challenge than a posting trot. Beginners can limit the jarring effect of the trot by lightening their seat and taking more weight in the stirrups while, at the same time, using their legs as shock absorbers. More experienced riders still allow their legs to flex during the sitting trot, but keep more of their weight in the saddle, sitting deeply as they relax the muscles throughout their crotch and legs. The relaxed rider allows his body to follow his horse's motion. He goes up as his horse goes up and anticipates and follows the downward motion of the horse rather than waiting for gravity to pull his body downward. This technique allows a rider to use his seat as one of his methods for directing the horse's movement. 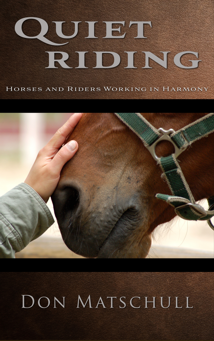 Without sitting deep in the saddle, the rider cannot perform a proper half- halt which is useful in achieving good transitions as well as collection. A properly collected horse rounds his back rather than making it hollow. This difference in the shape of the horse makes a spectacular difference in the quality as well as the comfort of the trot, especially if the horse is relaxed. Proper trotting can only be achieved through much practice. Proper instruction in the trot can only be done through observing the rider and correcting faults as they occur. As in all riding, a proper trot begins with a proper seat, balance, and relaxation. See the section on the seat for more on these topics.